When you automate a trading strategy, it is wise to have a safety net. The NanoTrader’s Safety Net will stop an automated strategy and flatten positions when a condition specified by the trader is met. Automated strategies are monitored based on the trader’s conditions. Conditions can be positive (profit reached) and negative (drawdown, loss). The automated strategy is halted when the trader’s condition is met. Any open positions are flattened when the trader’s condition is met. Monitoring can be done on the basis of three different conditions. If the Safety Net is triggered the trader is notified with detailed information. If the Safety Net is triggered it is shown in the chart. 1. WHAT SAFETY NET CONDITIONS CAN BE SET? Max Loss: The maximum tolerated absolute loss (Max Loss). Max DrawDown: The maximum tolerated drawdown of the profit/loss. This works like a TrailingStop based on the profit/loss curve. The drawdown is calculated with each tick (not only at the end of trades). ProfitTarget: Once the strategy generated the specified profit it is deactivated to secure the profit. The numbers represent cash values in the currency that the profit/loss for the traded symbol is shown in the account. E.g. it might be EUR for European futures or USD for American futures. If the Safety Net was triggered, NanoTrader will show a detailed message. In addition, the chart background will show the colour representing the flat state from that moment on. 2. HOW DOES THE SAFETY NET WORK? 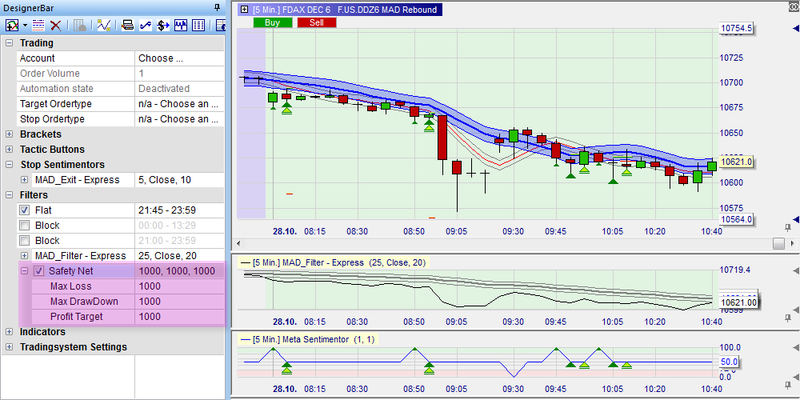 When AutoOrder is activated for a strategy (study), NanoTrader monitors the profit/loss generated. As soon as the profit/loss exceeds one of the specified numbers the Safety Net gets active. It closes the current position and discards all new signals generated by the study. The Safety Net is only active if it is checkmarked in the DesignerBar. In case it is checkmarked after the study was set to AutoOrder mode it still measures the profit/loss since the beginning of the AutoOrdering. After Safety Net halted the study, to let the study start AutoOrdering again just activate the AutoOrder state again – this will reset the Safety Net internals. The Safety Net settings are in the first instance a passive safety feature. Safety Net can also be used actively as part of a strategy or for money management purposes.